OPPO Philippines recently propelled the mid-range phone OPPO F3 with its own take on the dual-selfie camera feature, sleek body and appealing package. 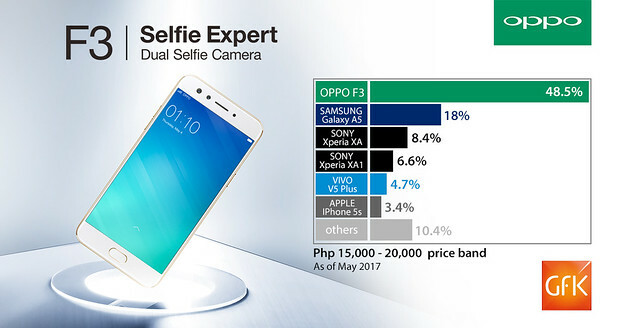 The recent GFK Philippines May 2017 report, shows that the OPPO F3 emerges as the No.1 cellphone at the price point of Php15,000 to Php20,000 smart phones, with a dominating 48.5% market share. OPPO F3 started great in the market with 22,000 unit sales in the initial three days of availability last May 2017. This mirrored its solid acceptance from buyers in view of the unique dual-selfie camera setup. The groufie camera empowers an extraordinary experience in catching stunning selfies with more range at any situation. In addition, the metal body and smooth appearance gives customers the luxurious feel perfect for its price, alongside an ample 4GB RAM for multitasking and 64GB storage for all files needed.